Slightly dotty this book! 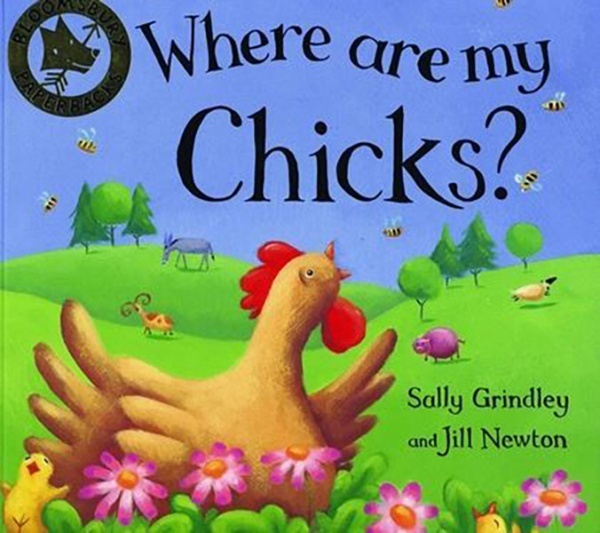 Absent-minded Mother Hen has lost her naughty chicks. The other animals on the farm rally round to help her find them – all except a rather disdainful Mother Goose. But the chicks keep disappearing again, and suddenly there are too many of them! Children I have read this to enjoy joining in with the counting, spotting the missing chicks and identifying the animals in Jill Newton’s colourful, quirky pictures. 1) Lots of things to count! Chicks, wing feathers, bees, flowers… what else? 2) Lots of animals to name. 1) Encourage children to join in with the counting. 2) Encourage children to make animal noises. 3) Encourage children to count other things in the pictures. 1) Opportunities for role play – Mother Hen and Mother Goose, of course, but all the other animals as well. 2) Create a drama in the classroom, casting the children in the different animal roles. 3) Why don’t we like Mother Goose in this story? 5) What other animals live on the farm and in the fields? Drawing opportunity? Descriptions?